Welcome to the first installment of the Countdown to Burt Fest series, where each installment will feature a different artist playing this year’s show. However, before we can start talking about the bands we have to talk about what Burt Fest is in the first place. Luckily, I was able to exchange a few words with the man himself, Greg Burt, to get an inside look at this annual Buffalo showcase. Burt Fest has not always been as big as it is today, however, it has seen a respectable amount of growth since its conception in 2014. Originally named ‘Move the Pole Fest’ (May 4th, 2014), in an attempt to raise money for the removal of the pole that plagued the front of the Forvm stage. Due to a positive response from bands and fans alike, the show would go on under its new name Burt Fest. During the proceeding years, the event would be held at multiple other venues including the Waiting Room, and even the Legendary Showplace Theater during its brief life in 2017. However, in 2018 the Fest made a historic leap to Buffalo Iron Works where it sold out the 350 indoor capacity. This year, Burt Fest will once again take on Iron Works where it will hopefully repeat its recent success. With a solid line up that spans multiple genres, 2019 is set to be one of the best years to date. When I asked Greg his formula for picking the festival's bands he told me, “My choices are kinda based on just whatever bands I’ve enjoyed working with the most during that year through FTMP Events' shows. Along with some staples that perform every year (Film House used to be Improbable Cause and has done almost everyone, haha. Derek Gregoire always performs one way or another. Matthew Ruhl has done a ton as well, and returns in his brand new band Insoluble. Amateur Hockey Club has members from The Odds Are whose performance at Move The Pole Fest of attacking the pole I will never forget, haha). The combination of old favorites and fresh new talent is what keeps Burt Fest interesting every year. While we are on the subject of bands, this year’s line up is looking very promising. Due to the multiple genre-spanning nature of the festival, we are able to see bands play together who normally wouldn't be on the same bill. For example, this year’s attendees will have the pleasure of moshing to Overlook, Dilettante and Scathed, while also listening to the soothing sounds of Previous Love and Maxwell Doldan. Burt Fest is truly the most inclusive mix of all the best acts that Buffalo has to offer, when I asked Greg who he was most excited to see he told me, “I handpicked all of the acts, they’re all great! Haha, I really don’t have any ‘stand out’ acts. I just advise people to not just come to ‘see their friend’s band.’ Every act in this year’s event is diverse & has years of experience. They have impressed not just me, but audiences from all over. 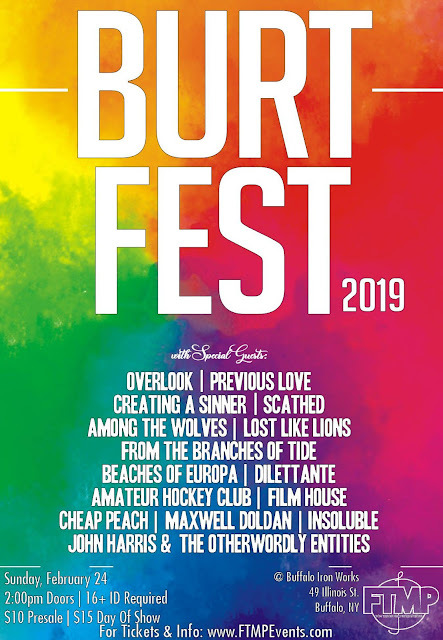 You might just find a new favorite band!” I could not agree with Greg more, if you are someone who has been looking for a way to start your exploration into the Buffalo music scene then look no further than Burt Fest. Greg also shared a few additions that will be new for 2019, including a compilation CD featuring a song from each band playing will be handed out at the door, and projector work from Tyler Furniss (who you might remember from the Fernway/Kill The Clock show at Iron Works on October 26th, 2018). These new additions just add to the already long list of reasons that you should attend this year’s festivities. Now that we have taken an in-depth look at what Burt Fest actually is, we can start to dive into all the great acts playing this year’s show. So, be on the lookout for the upcoming installments of the Countdown to Burt Fest series where you just might discover your new favorite band. However, until then, get off the charts and support local music.